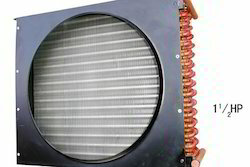 Our product range includes a wide range of condenser coils. We are engaged in offering a qualitative range of Condenser Coils that are widely used in the ammonia based refrigeration industry. These are made from heavy duty "U" Bends & heavy class ERW Pipes and are in compliance with the various industry standards. Moreover these are available in both standard as well as customized specification as per the requirement of our clients.